A Wakefield orthodontist has been invited to share her recipe for success with an international audience as part of a development programme by a leading US innovator. Dr Catherine McCanny is one of only five international orthodontists appointed by Align to share their successful secrets in a series of videos, blogs and seminars that will be streamed around the globe. From her Dewsbury Road base, the award-winning orthodontist has already filmed her hints and tips to be incorporated into a cook book style format as part of the Invisalign Practice Development Project. The Project will go live in March with fellow members representing Germany, Spain, Italy and France. Dr McCanny, who founded St Michaels Orthodontics, was chosen to be the UK adviser due to her early adoption of the Invisalign system and the mentoring she has already undertaken in the UK as a clinical speaker and as part of the Invisalign UK Advisory Board. “St Michaels has been using Invisalign since it was launched a decade ago and we have grown that side of our practice from small numbers of about ten patients a year to over a hundred annually,” she said. Catherine has recently reached the 500 milestone of cases submitted. “As early adopters we encountered the initial difficulties that deterred other practitioners embracing Invisalign. When I first started using Invisalign, it was very limited in what it could do, and I only used it for simple cases. However, the innovations that have taken place within the company over the last 10 years and my expertise as an orthodontist allows me now to treat very challenging cases. Initially it forced me out of my comfort zone as I had only used fixed appliances when training. I then had the challenge of bringing the team on board. I started to use it on some of my staff and they quickly realised the benefits of this system. They were then able to share their own experiences with our patients. “Developing that side of our practice has demanded investment in the personal development of our team and the installation of cutting-edge technologies. I quickly realised that the main advantage was an improved patient experience and I was getting excellent outcomes, so the long-term benefits paid dividends. The whole team here at St Michaels have embraced innovations and technologies such as I-Tero scanning which allows patients to visualise the end result before they commit to treatment” added Catherine. “Collating all our different experiences into a recipe book system will hopefully give fellow orthodontists confidence to take on board the benefits of digital technology. Experienced users can watch one video on a specific problem they are facing or practitioners new to Invisalign can use the videos and the book to help them as they start their Invisalign journey. Hopefully our shared experiences and ideas will help others take the leap of faith and introduce Invisalign as another treatment option to their patients. St Michael’s Orthodontics – a team of skilled orthodontists led by Catherine McCanny – is based on Dewsbury Road, Wakefield. Having graduated from Dental School at Queen’s University, Belfast in 1988, Catherine commenced her specialist training in Orthodontics at Leeds Dental Institute in 1993. She then teamed up with her now-husband, Joe, to build and develop St Michael’s Dental Practice and St Michael’s Orthodontics Ltd, which opened in 1998. More recently, Catherine – a member of the British Orthodontic Society – was delighted to win three awards in the Aesthetic Dentistry Awards, including the ultimate accolade of Best Aesthetic Dentist 2013. In 2015, St Michaels Orthodontics won three awards at the Aesthetic Dentistry Awards including ‘Best Team’ and again in 2018 where Catherine won the Best Invisalign case and the Best Child/Teenager fixed case. LEADING Yorkshire orthodontist, Dr Catherine McCanny Hendron has teamed up with two colleagues and a famous legal eagle to raise funds to support young girls rescued from trafficking and domestic violence in Nepal. 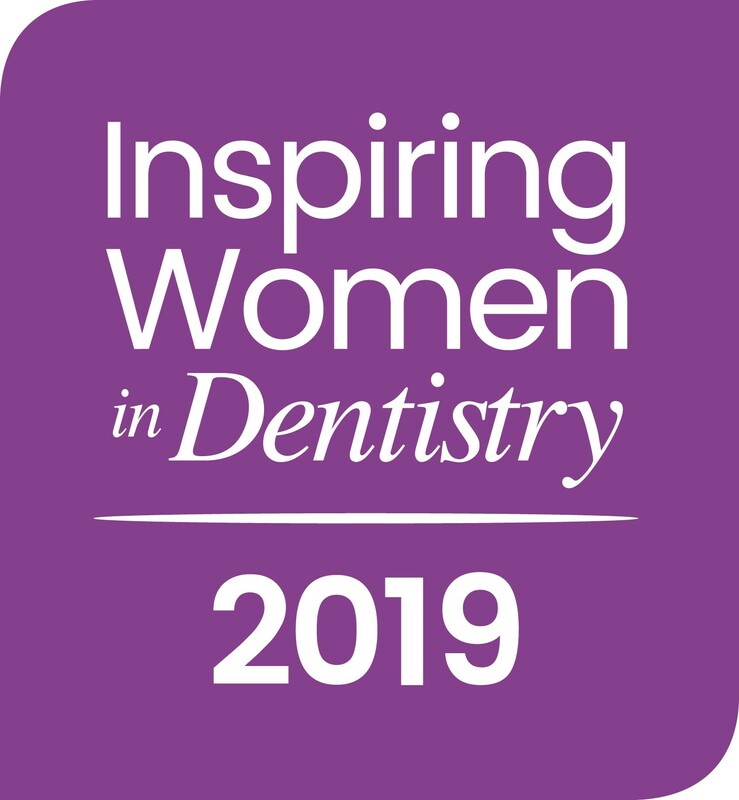 Dr McCanny will join fellow practitioners Martina Hodgson and Andrea Ubhi for a motivational day for fellow female orthodontists keen to build successful practices, with Marilyn Stowe offering legal and business advice. Multi award winning Catherine was keen to get involved in the project having built her own successful practice, but understanding the barriers that women can often face. As the mother of two daughters and the founder of St Michael’s Orthodontic Practice, Wakefield, which is an all female team she was also determined to improve the lives of forgotten young girls. “When we all met, we wanted to share our own experiences and expertise for the generation of female orthodontists coming through,” explained Catherine. “Women have a different perspective on orthodontics and now equal men in the number practising. Yet we have our own unique challenges,” she added. Please email andrea@andreaubhi.com or martinahodgson@hotmail.co.uk to reserve your place at this exciting event. Places cost £150 each, include tea & coffee and lunch. 100% of the profit goes to Asha Nepal, caring for survivors of trafficking and severe violence in Kathmandu. After the event, Andrea and Martina will be staying later for drinks and dinner. We would love for you to join us, so please let us know if you can! (Individual charges for after event drinks and dinner will apply). In 2015, when St Michaels Orthodontics won three awards at the Aesthetic Dentistry Awards including ‘Best Team’. Ready to smile with confidence? 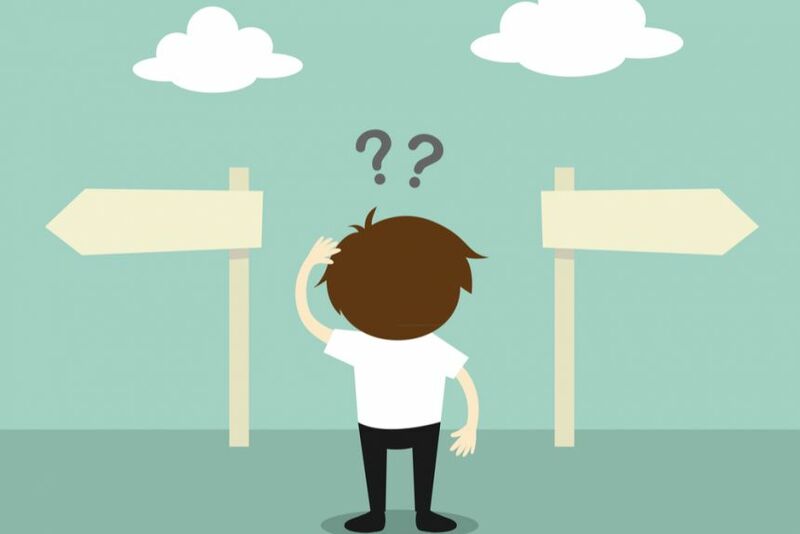 So you’re ready to change your smile, but how do you choose an orthodontist? For over 20 years, Dr Catherine McCanny has been changing the lives of patients at St Michael’s Orthodontics. Aside from the attractive smile and self-esteem boost that orthodontic treatment offers, there are many other benefits to a straight smile such as improved oral hygiene. No doubt if you are looking to begin your journey to a straighter smile you have done your research and will be familiar with the types of orthodontic appliance available. For many, understandably, the cost of treatment greatly impacts the decision for the practice you will choose for your treatment. “Why does the cost of treatment vary between different practices?” is a question we are often faced with. Many General Dental Practitioners are now expanding their scope of practice into the field of orthodontics, which is a factor that can affect the variation of treatment prices. Generally speaking, the cost of treatment provided by a Specialist Orthodontic Practice will be slightly more, but with that comes many advantages. Dentists and orthodontists both work to improve oral health. A dentist carries out general dental treatment, such as a check-up or fillings, however they may have a special interest in other areas like orthodontics or cosmetic dentistry. An orthodontist would firstly qualify as a dentist, then undergo 3 years of additional training to gain their Masters in Orthodontics. Specialist training means that an orthodontist would be able to carry out complex and comprehensive treatments. Advantages of treatment with St Michael’s Orthodontics Ltd.
We specialise in the field of Orthodontics. Our clinicians exclusively work within the orthodontic field, meaning all the staff know the treatments inside out. Our Principal Orthodontist has over 20 years’ experience in orthodontics, and more than 10 years’ experience of working with Invisalign. This year our orthodontist Catherine has reached her milestone of treating 500 patients using Invisalign and she has achieved Platinum Elite status, making her one of the most experienced Invisalign providers in the UK. Last year Catherine was appointed a clinical speaker for Invisalign- a recognition of her experience and expertise in this field. 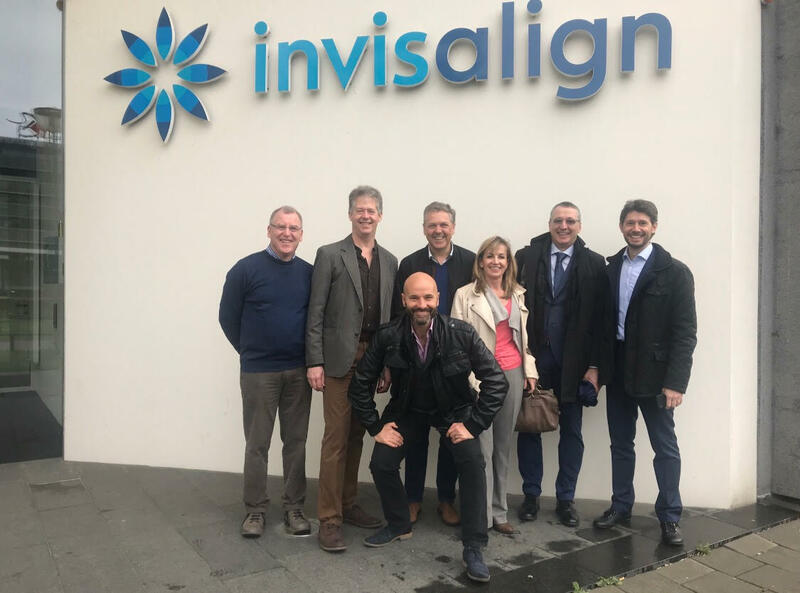 She is now a member of the UK Invisalign advisory board and has been appointed as the UK representative for the Invisalign Cookbook which she has developed with 4 other European orthodontists in sharing their secret recipes for growing a successful Invisalign practice. We offer different finance packages to spread the cost of your treatment (including 0% finance). 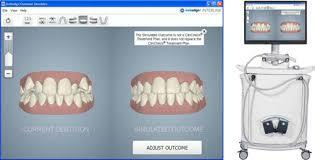 We offer a range of orthodontic appliances. Fixed metal braces, ceramic braces, Invisalign, Invisalign Teen, Invisalign First…so whatever your preference or concern we’re sure to have a solution. All our staff are actively involved in the world of Orthodontics. We are all keen to progress with training, and stay updated with the most recent treatment techniques by attending the British Orthodontic conference annually. We have two members of staff appointed the position of treatment coordinator. Our treatment coordinators are trained and experienced in communicating with patients to find the best way to work with you. They can offer advice, guidance and reassurance help patients discover all their options and what will work best for them. We hope our guide to the advantages of seeking treatment with St Michael’s Orthodontics has helped in your decision making for your own smile transformation. There are also many benefits to orthodontic treatment with a specialist orthodontist, and as with most things it comes down to personal preference and what you feel would give you the best options. 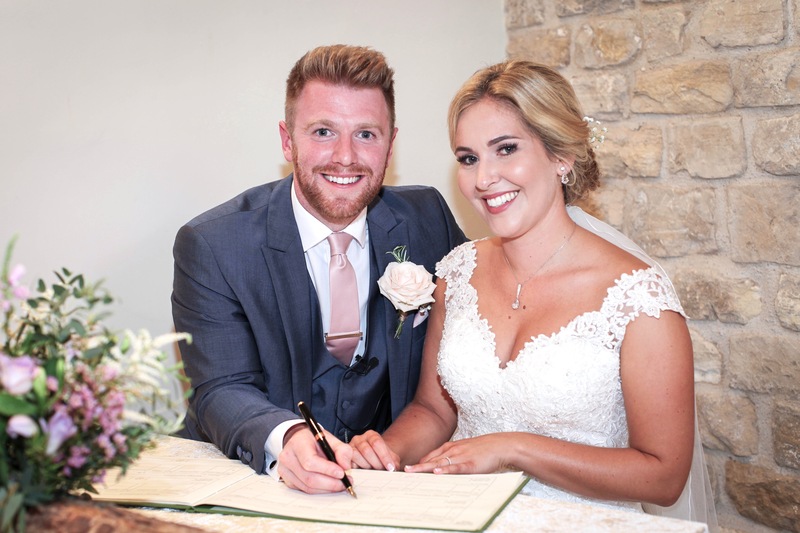 ONE Yorkshire couple had more reason than many to smile on their big day as they showed off their dazzling new smiles, having had Invisalign treatment to straighten their teeth. Sam and Vicki Shute were both patients at St Michaels Orthodontics, Wakefield, when they decided to take the plunge and have orthodontic treatment. But rather than Vicki persuading Sam to have treatment, he was first to book his consultation with Dr Catherine McCanny, after seeing photos of himself at his brother’s wedding and deciding enough was enough. “I was always aware that my teeth weren’t straight but seeing how pointed they were at the front on my brother’s wedding photos made me decide to do something about it,” said the business development manager from Sandal. Sam had almost completed his treatment and the pair were engaged when Vicki noticed how her teeth were moving. Dr McCanny of St Michael’s Orthodontic Ltd has treated nearly 500 patients with Invisalign since it launched 20 years ago but was delighted to treat a couple who were planning their big day. ‘It was a great feeling to be able to give this lovely young couple a fantastic new smile for their wedding day and be part of the whole plan. We were all so excited to see their wedding photographs’. “Increasingly men are aware of their looks and how it affects their careers and confidence so I wasn’t surprised that Sam came along but it was really special to be treating his fiancée at the same time. The tricky part was timing the treatment so that the aligners came off for the big day. Sam’s treatment was finished while Vicki need some refinements after the wedding that were easy to schedule in,” said Dr McCanny. More recently, Catherine – a member of the British Orthodontic Society – was delighted to win three awards in the Aesthetic Dentistry Awards, including the ultimate accolade of Best Aesthetic Dentist 2013. This success was repeated in 2015, when the practice picked up a further three awards, including ‘Best Team’. Catherine McCanny is an Invisalign Elite Platinum Provider. AWARD winning Wakefield orthodontist, St Michael’s has appointed two treatment coordinators as part of its investment in patient care. The two will work alongside orthodontists at the Dewsbury Road practice to offer advice, guidance and reassurance to patients throughout their treatment. Clinically trained, Dawn Rimmington and Joanne Reape will be the first point of contact with patients to explain the orthodontic procedures they will undertake, how to care for their braces at home and also discuss payment plans. Dr Catherine McCanny, orthodontist explained: “Patients are keen to enjoy the end result of the treatment which is attractive and healthier aligned teeth, but naturally they have questions. I was very conscious that some patients were reticent to ask me about things such as payment plans or even ask questions about their treatment or teeth because they thought they were too silly. “We completely understand that but at the same time we don’t want patients to go away feeling they are in the dark about their treatment. Dawn and Joanne act as a bridge between clinicians and patients and can often pre-empt questions through the comprehensive advice they provide about home care during treatment. They offer advice about care of braces, how long to wear them and the best kinds of foods to eat to enhance a patient’s results. “With their own consultation room patients are confident of being able to ask anything discretely,” she added. 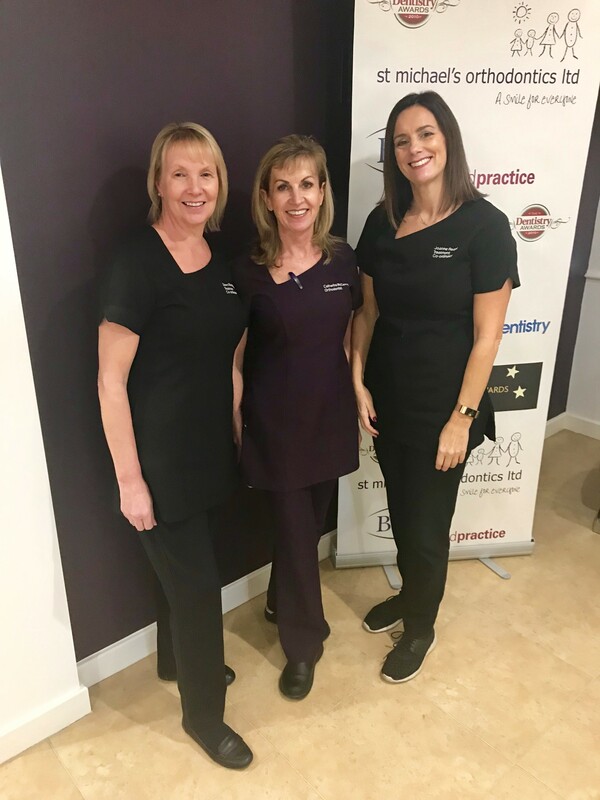 “We are the first point of contact when patients first come in for a consultation about orthodontics and so they are able to build a long lasting informal yet confidential rapport with us so that they get the most out of their treatment,” said Dawn. We gave patients a questionnaire to fill in whilst waiting for their appointments. The results are from forms that were completed correctly. What was your age on your last birthday? The results showed a fairly even cross section in gender, the largest percentage attending the practice were under 18 (72%). What language do you prefer to speak in? Do you need an interpreter or help to communicate? 96% of patients preferred language to communicate was English, of the 4% that selected another language as their preferred no one required the use of an interpreter. SMOL has a Translation Policy in place if required. Do you regard yourself as belonging to any particular religion? To which of the following groups do you consider you belong? Some patients (24%) preferred not to answer the question, of those giving a response 72% answered Christian, Church of England and the remaining 28% said Muslim. Did you have any difficulty accessing the Dental Practice today? No patients had problems accessing the service. Are your day-to-day activities limited because of a health problem or disability which has lasted or is expected to last at least 12 months? Do you have any of the following conditions lasting (or expected to last) 12 months or more? The majority of patients answered no to this question (92%). Those answering yes selected depression (4%) and asthma (4%) as ongoing health problems. The practice updates medical history forms every 6 months for routine patients, this ensures we have the latest health information available to the clinical staff providing care. After reviewing the answers given in the questionnaire no patients reported having any concerns about the way they were treated at the practice and no patients had problems with access. We do not feel any changes are required at the present time but we will continue to listen to patients’ feedback and make any changes should they become necessary. We will continue to work hard to ensure all patients and visitors to the practice feel their rights are being respected and their needs are being met. Beating mouth cancer is so dependent on diagnosing it at an early stage. If it is caught early, the chances of surviving mouth cancer are nine out of ten – those odds are pretty good, and that’s why early detection is so important. Sadly, far too many mouth cancers are not spotted early enough. Mouth Cancer Action Month promotes the message ‘If in doubt, get checked out’. We encourage everybody to be mouthaware and pay more attention to what’s going on inside the mouth. Most importantly, if you notice anything out of the ordinary, it is essential that you tell your dentist or doctor immediately. 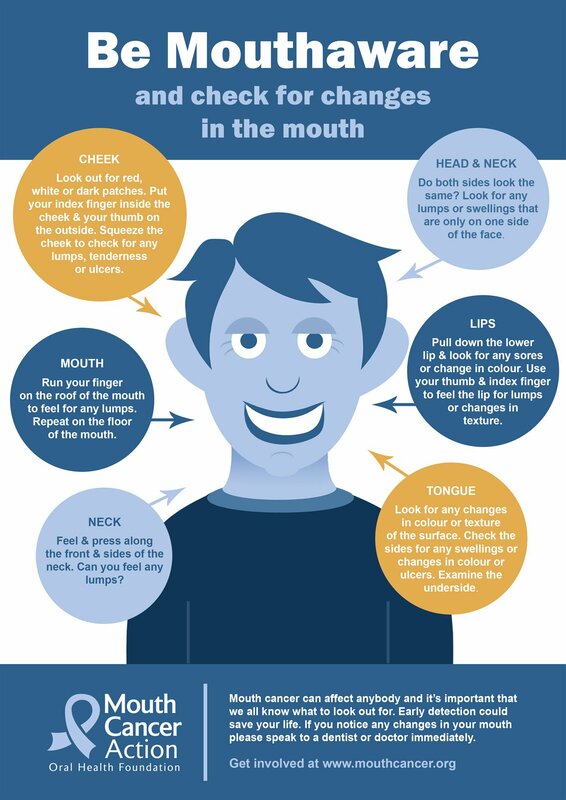 As mouth cancer can strike in a number of places, including the lips, tongue, gums and cheeks, and given that early detection is so crucial for survival, it’s extremely important that we all know what to look out for. Mouth ulcers which do not heal in three weeks. Red and white patches in the mouth. Unusual lumps or swellings in the mouth or head and neck area. Check if both sides look the same and search for any lumps, bumps or swellings that are only on one side of the face. Feel and press along the sides and front of your neck being alert to any tenderness or lumps to the touch. Pull down your lower lip and look inside for any sores or changes in colour. Use your thumb and forefinger to feel the lip for any unusual lumps, bumps or changes in texture. Repeat this on the upper lip. Use your finger to pull out your cheek so that they can see inside. Look for red, white or dark patches. Then place your index finger inside your cheek, with your opposing thumb on the outside gently squeeze and roll the cheek to check for any lumps, tenderness or ulcers, repeat this action on the other cheek. With your head tilted back and mouth open wide, your dentist will look to see if there are any lumps or if there is any change in colour. They will run their ﬁnger on the roof of your mouth to feel for any lumps. Examine your tongue, looking at the surface for any changes in colour or texture. Stick out your tongue or move it from one side to another, again looking for any swelling, change in colour or ulcers. Finally, take a look at the underside of the tongue by placing the tip of your tongue on the roof of your mouth. Look at the floor of the mouth for changes in colour that are different than normal. Press your finger along the floor of your mouth and underside of your tongue to feel for any unusual lumps, swellings or ulcers. If you find anything unusual in any of these areas, or are unsure of anything, visit your dentist or doctor as soon as possible. How can mouth cancer be detected early? Mouth cancer can often be spotted in its early stages by your dentist during a thorough mouth examination. This happens during your routine dental check-up. 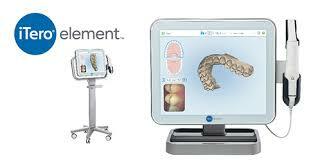 The taking of dental impressions is now a thing of the past thanks to our state of the art iTero dental scanner. This £21,000 high tech scanner not only removes the discomfort from obtaining a dental impression but enables us to provide you with a more flexible, accurate and productive service. The handheld scanning technology creates a digital ‘dental impression’, producing highly accurate 3D images of your mouth that can be rotated, zoomed and manipulated in various ways. It provides a record of the exact dimensions of your teeth and gums and, with the magic of technology, we can even forecast what your teeth will look like after treatment. With the ability to capture up to 6,000 frames per second, our trained staff simply move the wand-like scanner over your teeth and gums, stopping and starting it as often as necessary. The new process is far preferable for patients who no longer need to have impression material in their mouth for several minutes – a method which caused some people to gag uncomfortably. Being able to send the impressions to the lab digitally means a quicker turn around, saving you weeks of waiting, and with the scanner able to forecast the different treatment outcomes, you will have all the information you need up front to enable you to make an informed decision about the different treatment outcomes available. 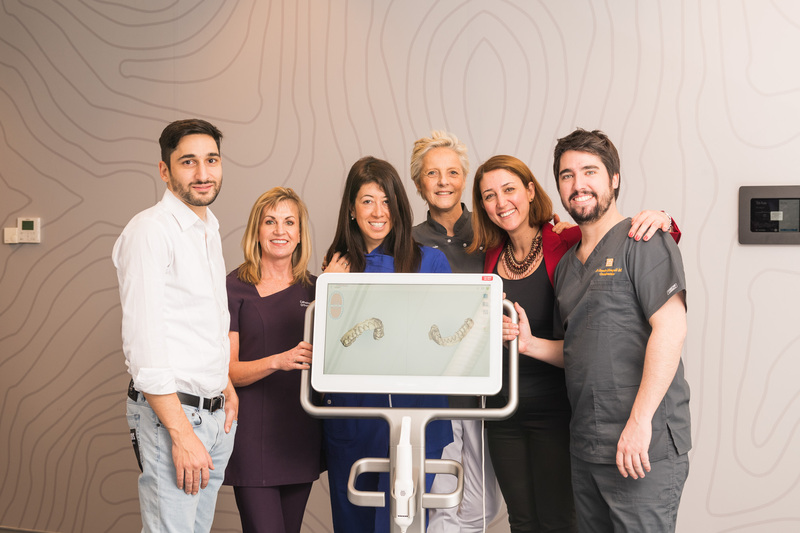 The iTero technology is not only improving the overall experience for patients but is in line with the excellent level of service we aim to provide at St Michael’s Orthodontics to ensure patient confidence. To discover how iTero can benefit you, contact us at orthostmichaels@tiscali.co.uk or check out our websites: https://www.stmichaelsorthodontics.co.uk/ or www.invisiblebraces-yorkshire.co.uk. AN award-winning Wakefield Orthodontist, who runs a female only practice has been selected as a global ambassador for an international company. Dr Catherine McCanny, specialist orthodontist at St Michael’s Orthodontics, Dewsbury Road, has been chosen as a clinical speaker and key opinion leader for Invisalign, thanks to her experience and expertise using the invisible brace system for complex cases. As the UK’s only second female Invisalign speaker, she wants to encourage more orthodontists to pick up the baton to help patients achieve straight teeth pain-free. One of the most experienced Invisalign practitioners in the UK Catherine has helped 1000s of patients achieve a better smile without the need for surgery. It was this track record that won her Platinum Elite Status and prompted the company to invite her to share her knowledge with other orthodontists. “Invisalign aligns patients’ teeth in an almost invisible way; it is a much more comfortable and efficient alternative to fixed braces. In even the most complex cases it has eradicated the need for surgery. Thanks to my experience with the treatment, I now use Invisalign for the most complex of cases,” said Dr McCanny. Catherine received her clinical speaker training in Amsterdam earlier this month and will start her new role in Birmingham on 3rd May. This recent accolade follows her success at the 2018 Aesthetic Dentistry Awards where she snapped up two awards relating to the use of Invisalign plus the treatment of teenagers. Catherine added: “I am extremely privileged and honoured to be chosen by Invisalign as a Clinical Speaker. This international treatment is globally recognised and I hope this showcases St Michael’s Orthodontics as a worldwide centre of excellence. More recently, Catherine – a member of the British Orthodontic Society – was delighted to win two awards in the 2018 Aesthetic Dentistry Awards. In 2015 St Michaels Orthodontics won three awards at the Aesthetic Dentistry Awards including ‘Best Team’. Catherine McCanny is responsible for keeping secure the information about you that we hold. Our data protection officer, Carol Walter, ensures that the practice complies with data protection requirements to ensure that we collect, use, store and dispose of your information responsibly. We will share your information with the NHS Business Services Authority in connection with your dental treatment. If we wish to use your information for Social media, dental research or dental education, we will discuss this with you and seek your consent. 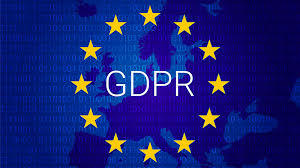 Depending on the purpose and if possible, we will anonymise your information. If this is not possible we will inform you and discuss your options. You have a right to access the information that we hold about you and to receive a copy. You should submit your request to the practice in writing or by email. There may be a charge for copies of your information; if we pass on a charge, we will explain the reasons. © st michael's orthodontics. All Rights Reserved 18 january 2019 | Website Design & Video Production By FooCo Ltd.